Joel Edward McHale (born November 20, 1971) is an American comedian, actor, writer, television producer, and television host. He is known for hosting The Soup and portraying Jeff Winger on the NBC/Yahoo! sitcom Community. He has appeared in such films as Spy Kids: All the Time in the World (2011) and Ted (2012). He currently stars in the CBS sitcom The Great Indoors. McHale was born in Rome, Italy, where his father, Jack McHale, worked as Dean of Students at Loyola University Rome Center. His mother, Laurie, is from Vancouver, Canada, and his father is from Chicago, Illinois. Of Irish and Norwegian descent, he was raised Catholic in New Jersey and Seattle, Washington. He attended Mercer Island High School. McHale received a bachelor's degree in History from the University of Washington in 1995. While at the University of Washington, McHale very briefly belonged to the Theta Chi Fraternity. He was recruited to be on the rowing team, but later joined the football team. Despite most of his fellow players receiving scholarships to be on a major college team, McHale was a walk on, playing tight end for two years. According to the football team site, he did not letter in football. He received a Master of Fine Arts degree from the Professional Actors Training Program at the University of Washington. As a Seattle native, he is a fan of the NFL's Seattle Seahawks. McHale starred in the sitcom Community, which premiered in winter 2009, and continued to host The Soup. McHale made an appearance on the first episode of the fifth season of Tosh.0. He played Rex in Ted (2012) and had a short guest stint on the FX show Sons of Anarchy. He played an NYPD officer in the supernatural horror film Deliver Us from Evil. McHale appeared in The X-Files' 2016 miniseries. McHale will play the lead role in the CBS sitcom The Great Indoors, which will begin airing in the Fall of 2016. McHale was the featured entertainer at the 2014 White House Correspondents' Association annual dinner. He also hosted the 2011 Independent Spirit Awards and the 2015 ESPY Awards. McHale married Sarah Williams in 1996. They have two sons. They live in Hollywood Hills, California. On episode 6 of The Nerdist Podcast Joel and Chris Hardwick talked about being neighbors, including a story about Joel's son Eddie dressing up as a light switch for Halloween. 2011 Phineas and Ferb Norm head prototype (voice) Episode: "Candace Disconnected/Magic Carpet Ride"
McHale, Joel (October 25, 2016). Thanks for the Money: How to Use My Life Story to Become the Best Joel McHale You Can Be. Penguin Audio. ISBN 978-0735289000. ↑ Pollak, Kevin; McHale, Joel (November 15, 2010). "Kevin Pollak Chat Show" (Interview). Interview with Kevin Pollak. ↑ Smith, Grady (November 25, 2011). "Monitor: Nov. 25, 2011". Entertainment Weekly (1182): 30. Retrieved April 4, 2015. ↑ "PIERS MORGAN TONIGHT, One-on-one with Joel McHale; The Great Anjelica Huston". CNN. March 15, 2012. ↑ Strawberry, Saroyan (June 2008). "Joel McHale". Details. Retrieved December 19, 2015. ↑ Brodeur, Nicole (August 22, 2004). "From Mercer Island, jumping into "The Soup"". The Seattle Times. Retrieved December 19, 2015. ↑ Curran, Dan (October 16, 2008). "An interview with the king of snark Joel McHale". onmilwaukee.com. Retrieved March 30, 2012. ↑ Steinberg, Dan (February 14, 2005). "THECHAT: Joel McHale". The Washington Post. p. D02. Retrieved March 30, 2012. ↑ McHale, Joel (September 29, 2011). "The Walk-On: The Community star recalls his two-year football career at the University of Washington". Grantland. ESPN Ventures. Retrieved March 30, 2012. ↑ Fernandez, Maria Elena (April 4, 2009). "NBC unveils new programs for fall". Los Angeles Times. Retrieved May 4, 2009. ↑ Weprin, Alex (May 4, 2009). "E! Expects Joel McHale To Stay On 'Soup'". Retrieved May 4, 2009. 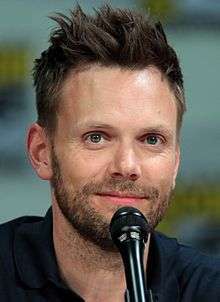 ↑ "Joel McHale talks 'Community,' 'Soup' and upcoming movie". masslive.com. ↑ "Why Joel McHale Is Even More Excited About The X-Files Revival Than You Are". E! Online. July 14, 2015. Retrieved January 29, 2016. ↑ Wagmeister, Elizabeth (February 16, 2016). "Joel McHale to Star in CBS Comedy Pilot 'The Great Indoors.'" Variety.com. Retrieved May 19, 2016. ↑ Rife, Katie (May 18, 2016). "Manly Men and Eccentric Geniuses Dominate CBS’s Fall Schedule." AVClub.com. Retrieved May 19, 2016. ↑ "Joel McHale will host the White House Correspondents' Dinner". Los Angeles Times. February 14, 2014. Retrieved February 14, 2014. ↑ The Soup. January 15, 2010. E!. ↑ "'Countdown with Keith Olbermann' for March 12". Retrieved January 15, 2010. ↑ "'Flipping Out's' Ryan Brown settles down in Los Feliz". latimes. ↑ "'Nerdist Podcast Episode 6: Joel McHale". Wikimedia Commons has media related to Joel McHale.